Some people say that inspiration is born of desperation, which is exactly what happens when it is cold and gloomy on a summer holiday and nothing sounds better than some coffee with Bailey’s. Except that when the holiday lands on a Sunday and nobody thought of this ahead of time and you are in Minnesota, then you are out of luck because liquor stores are closed on Sundays. 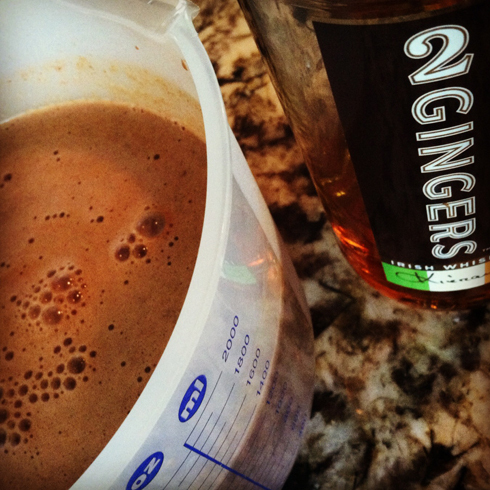 It was on a day just like this that the recipe for Chocolate Whiskey Ice Cream was born. My thought was that a little scoop of the ice cream would be PERFECT in coffee, except that it was so tasty that it never quite made it that far. Although this ice cream technically meets my criteria for low-calorie at 201 calories/serving, a half cup size serving is not huge. So, watch the portion size when dishing up. Compared to other premium ice creams, it has about 1/3 fewer calories. Which seems shocking because it sure does not taste low in calories, even relatively speaking. – The first time I made this, I used 2% milk. It was really tasty. The second time, I used raw milk and I could definitely taste a creamier difference. Because I believe that convenience sometimes trumps all, use whatever is easiest for you. – As far as whiskeys go, I have become partial to 2GINGERS. It is really tasty in cooking, baking, and in cocktails. It is versatile and pretty smooth. I would totally recommend it. – Have you tried the Dutch cocoa powder from Penzeys? It is AMAZING. If you’re ordering some to give it a try, might as well get some Sandwich Sprinkle while you’re at it. Not needed for this recipe of course, but good on every other thing in the world. In a large bowl, whisk together the egg yolks and powdered sugar until it is lighter in color (similar in color to butter) and texture. Set aside. In a double-boiler, heat the milk over medium heat. Very slowly, add about 1/3 c. of warm milk to the egg mixture and keep mixing. Adding the milk too quickly can result in cooked egg bits, so do it slowly and just keep the mixer moving. Slowly mix in the cocoa powder and vanilla, mix until well blended. Return the milk mixture to the double boiler and heat until thickened and coats the back of the spoon. Stir the milk frequently to be sure it isn’t sticking to the bottom, and so that you can tell when it starts to thicken up. If your double-boiler is small (like mine), do this step in two batches. Remove from the heat and stir in whiskey. Cover and refrigerate for a few hours. When it is thoroughly cooled, churn in ice cream machine for about an hour. Spoon into a container and freeze for a few hours. I’ve also made this with chocolate chips instead of cocoa powder, and it was great. In that case, omit the cocoa powder, and stir in the chocolate chips at the end, but before the whiskey. Even after freezing, this ice cream has a texture similar to soft serve. I don’t know if I will ever make this (since I don’t cook/bake/make much), but it sounds amazing. 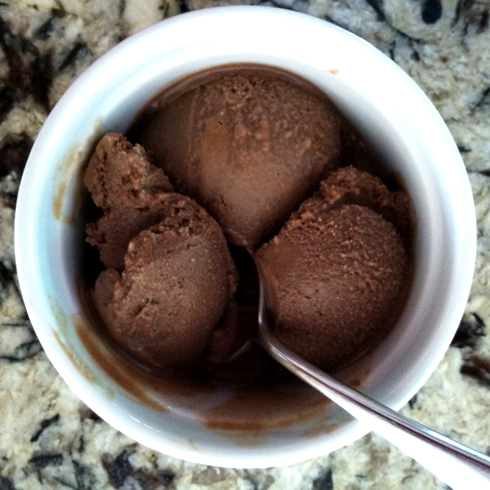 I saw your photo on TasteSpotting, beautiful photo and the recipe sounds amazing! I just bought an ice cream maker, I cannot wait to try! Thanks Mindy and Tracy, I appreciate it. Tracy, good luck with your new ice cream maker. I love mine.